II. We don’t stop at puppetry. 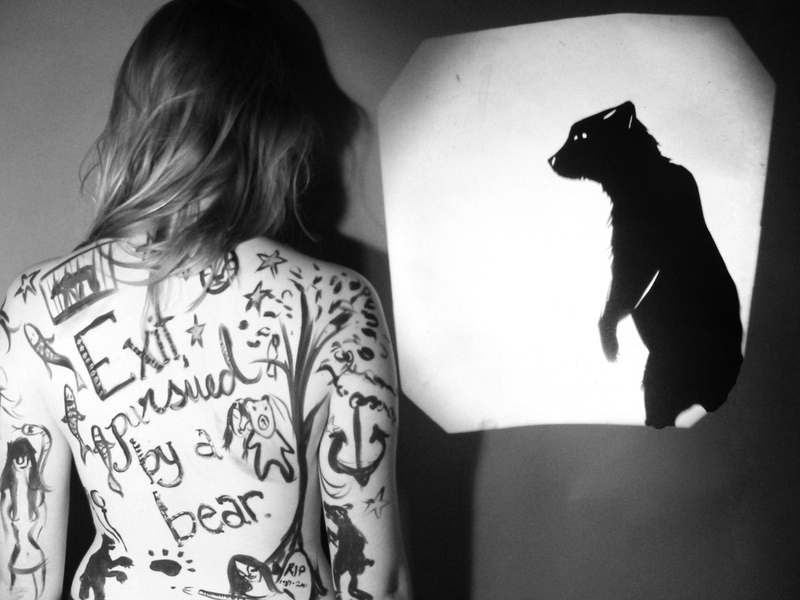 In addition to new puppets by Quality Slippers Productions, Exit, pursued by a bear. includes an original script by bekky O’Neil, original music by indie folk artist extraordinaire Ronley Teper (www.ronleyteper.com) & Her Lipliners, original shadow puppet work by My Brother the Changeling (mybrotherthechangeling.tumblr.com), performances by both live actors and puppets, (including a 9 foot tall Grizzly Bear!) and totally epic dance numbers. We’re not into the kitchen sink drama – we want spectacle from the theatre. We want to feel a moment of togetherness. Experience. Shared ritual… and most of all – fun. III. Bears are cool. During the hundreds of thousands of years we’ve lived in the Northern hemisphere, we’ve never shared the space with a large population of apes. Instead, we find ourselves living alongside bears: majestic, often massive creatures, with big forward facing eyes, hands that can pick things up, and have the ability to walk on two legs. Its no surprise that many of our ancestors believed we were descended from bears, that they are our not so distant relatives. How long can we puzzle over a single stage direction’s mystery? Why do these five words hold such a sway over our imaginations? The show features design by Keith Del Principe and bekky O’Neil, performances by actors Adriana Disman & David Schaap, and puppeteers Anders Yates, Leah Fay Goldstein, Aly Livingston & Andrew Young. It also features the incredible and sometimes peculiar music of Ronley Teper’s Lipliners (myspace.com/ronleyteper), and the sometimes bizarre but always absurd undoubtedly adult puppets of Quality Slippers Productions. On the streets of Vancouver a young girl befriends a prophetic beggar who never tells the same story twice. 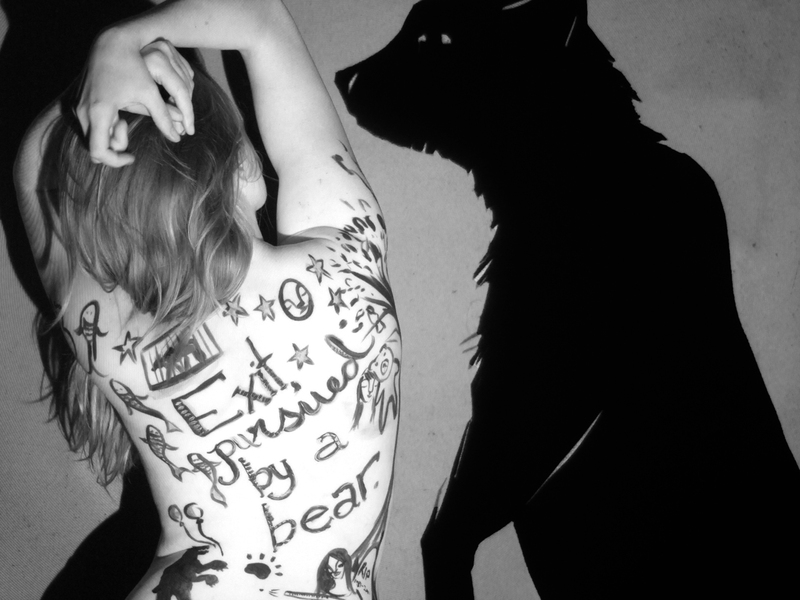 Her dreams are being haunted by a mysterious Grizzly Bear. Could this curbside encounter reveal the troubling truth that connects these star-cross’d strangers? 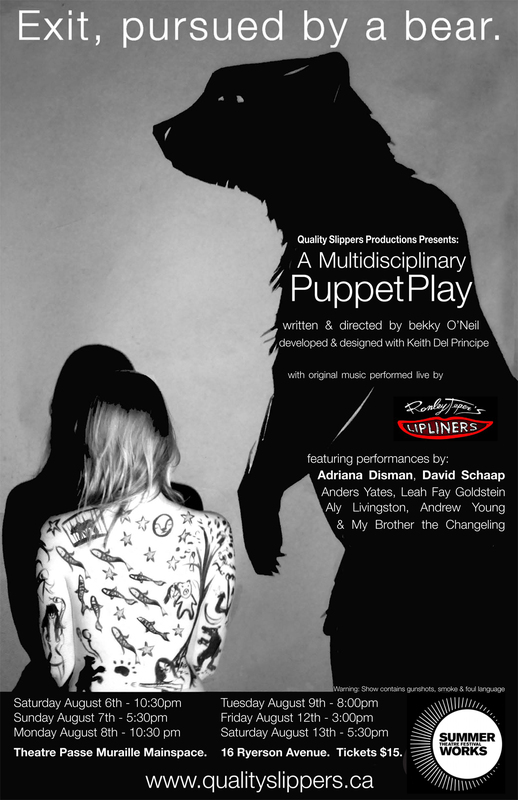 Quality Slippers Productions, maker of absurd, phantasmagorical and undoubtedly adult puppet shows is proud to present a collaborative multidisciplinary play exploring the many relationships between humans and bears. Performed with original live music by Toronto’s own Ronley Teper & Her Lipliners (myspace.com/ronleyteper). A hybrid tale of MTV & myth. Music written and performed by: Ronley Teper & Her Lipliners. WARNING: Performance contains smoking, gunshots & mature language. This entry was posted in Uncategorized by summerworks. Bookmark the permalink.